Mobility-related technologies are evolving rapidly, transforming the safety and convenience of transportation. Many of these new features are enabled by the collection of new types of data, putting the topic of privacy in connected cars on the agenda of industry, policymakers, and regulators. Advancing sensible practices will be essential to ensure that the collection and use of this data is responsible, thoughtful, and communicated effectively to consumers. Many of today’s safety and infotainment technologies collect data about drivers, other vehicles, and the environment in order to function. New safety capabilities hinge on the ability of cars to communicate with each other, and with infrastructure, to know what is ahead on the road. Decisions that were previously manual are now automated, relying on data inputs collected from each of the many new kinds of sensors being built into cars. With each step towards this driving future, our cars become data-crunching devices that function more like computers and smartphones than the mechanical chassis of the past. The Future of Privacy Forum (FPF) is driving a Connected Car Project to advance privacy practices and understanding as new mobility technologies come to market. We help ensure responsible practices are in place so that the benefits of technologies will be well-received by consumers. As the leading advocate for business practical approaches to consumer privacy, FPF has been at the vanguard of privacy issues related to geolocation, Smart Cities, and unmanned aerial vehicles. FPF’s goal is to promote leading privacy practices and industry solutions for emerging technologies. Filing comments with regulators, including the FTC and NHTSA, describing the benefits of connected cars. On May 1, 2017, FPF filed written comments in to the FTC and NHTSA in response to their request for input on the benefits and privacy and security issues associated with current and future motor vehicles. On April 12, 2017, FPF submitted written comments to NHTSA in response to their Notice of Proposed Rulemaking on Vehicle to Vehicle Communications. On November 22, 2016, FPF filed written comments in response to NHTSA’s Request For Comments on the Federal Automated Vehicles Policy. Serving as an active public voice about benefits to individuals and society of connected cars and the need to address data privacy and security risks, including serving as an expert resource for industry and government. Publishing a white paper, The Connected Car and Privacy: Navigating New Data Issues, to educate policymakers and other stakeholders on technology and data collection issues. Hosting stakeholder convenings with carmakers, suppliers and technology leaders to advance the conversation around the management and use of personal information across the connected vehicle ecosystem. Developing, in partnership with the National Automobile Dealers Association, a consumer guide to educate drivers about data collection and use. The guide provides consumers with an understanding of how to protect information that is stored, synced, or shared with a vehicle and provides privacy tips such as how to clear data from a vehicle before reselling it. Developing a taxonomy to identify and better analyze how personally identifiable information is collected, used, and shared by connected cars, including creating an Infographic Guide to Data and the Connected Car. Working with automakers to advance privacy principles for connected cars. Our Connected Car Project working group is an ongoing collaborative effort to pursue best practices by car manufacturers and technology suppliers, many of whom are members of FPF’s advisory board. Connected Cars Working Group meetings are generally held once per month. FPF members are welcome to join these discussions. If you would like call-in information (or to be added to the working group), please contact Lauren Smith at [email protected]. 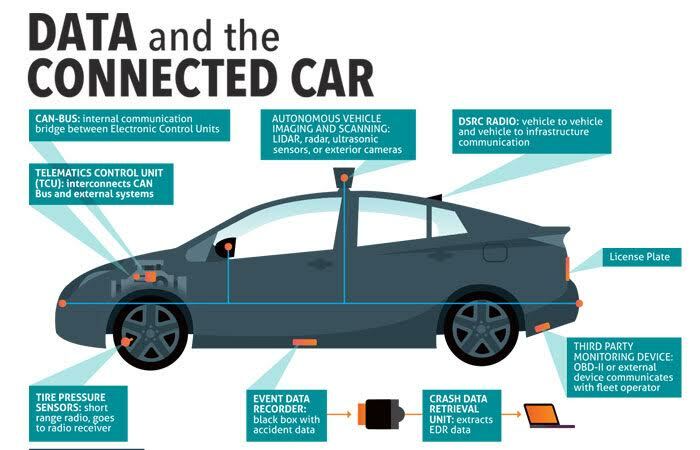 On June 27, 2017, the Future of Privacy Forum released an infographic, “Data and the Connected Car – Version 1.0,” describing the basic data-generating devices and flows in today’s connected vehicles. The infographic will help consumers and businesses alike understand the emerging data ecosystems that power incredible new features—features that can warn drivers of an accident before they see it, or jolt them awake if they fall asleep at the wheel.